Beautifully engraved certificate from the Prodigy Communications Corporation issued in 2001. This historic document was printed by the Security-Columbian Banknote Company and has an ornate border around it with a vignette of the Prodigy Communications Corporation company logo. This item has the printed signatures of the Company's Chairman and Chief Executive Officer, and Secretary and is over 2 years old. In November 2001, SBC Communications acquired Prodigy as part of a tender offer for all outstanding Class A common shares. Prodigy Communications, a subsidiary of SBC Communications, is one of America's leading Internet service providers (ISPs) serving the largest number of high-speed digital subscriber line (DSL) Internet customers in the United States. Founded in 1984 as the first consumer online service, the company together with SBC has grown to serve more than 3.6 million customers. Prodigy Communications Corporation (NASDAQ: PRGY) is a leading Internet service provider (ISP) serving the largest number of digital subscriber line (DSL) Internet subscribers. Since its founding in 1984 as the first consumer online service, Prodigy has grown to offer extensive features and services to its more than 3 million owned and managed customers. Expanding on its history as an innovative Internet company, Prodigy launched its dedicated broadband homepage in 2000 in preparation for the more than 30 million households expected to have broadband connections by the year 2005*. Prodigy intends to be the leader in providing broadband Internet applications and services to customers - from communications and information to entertainment. With its relationship with SBC Communications Inc. (NYSE: SBC), a leader in DSL Internet services, Prodigy is well positioned to help shape a new Internet experience for its customers in a high-speed, instantly on world. Prodigy has been at the forefront of the Internet revolution. Highlighted firsts include the first consumer online service to offer World Wide Web access to Members. 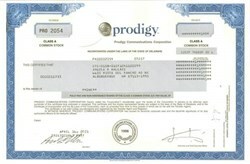 Prodigy also was the first to offer its members the ability to publish personal World Wide Web pages. Today, Prodigy's nationwide dial network covers more than 90 percent of the United States. With more than 2,500 local dial numbers available, Prodigy customers can access the Internet almost anywhere with a local phone call. Prodigy was one of the first ISPs to offer a dedicated broadband homepage for its customers. Prodigy is the preferred ISP for SBC's dial and DSL Internet customers. SBC residential customers who choose DSL Internet service for high-speed, instantly on access will also get, at no additional cost, access to Prodigy's broadband homepage, as well as a dial account they can use when traveling. Prodigy's network is consistently rated one of the best in the industry. Inter@ctive Week ranked Prodigy No. 1 in network reliability and No. 2 in network performance in its September 2000 "Internet Service Provider Customer Satisfaction Survey." Network World recognized Prodigy as one of the top three national providers for network availability during business and evening hours in its January 2001 "Top ISP Report." Prodigy has a strategic partnership with SBC Communications, a global telecommunications company that leads the nation in providing DSL Internet services. SBC's Project Pronto plan will provide high-speed DSL Internet service to nearly 77 million customers in the United States by 2003. Prodigy serves as the exclusive ISP and portal for SBC's DSL service and dial customers served by its regional brands (Southwestern Bell, Pacific Bell, Nevada Bell, Ameritech and Southern New England Telephone). Since going public in February 1999, Prodigy has grown its membership from just over 1 million then to 3.3 million in June 2001, and revenues have increased from $173 million to an expected $355-365 million in 2001. In January 2001, Prodigy and SBC renegotiated their strategic and marketing agreements, extending their relationship through 2009. Under the agreements, the two companies take advantage of their respective strengths: Prodigy provides Internet content, news, e-mail and other services, and SBC manages network access, customer care and distribution channels. As a result, the agreement allows Prodigy to be more profitable and dedicate more resources to enhancing its portal and launching new services and applications. The company's revenues come from three primary sources: subscriptions and management fees, advertising and e-commerce revenues, and portal services. Prodigy receives revenue from SBC for providing its broadband portal and related services to SBC's DSL Internet customers. Prodigy receives $5 for each SBC DSL customer. (Customers pay SBC for DSL Internet and receive a Prodigy dial account at no extra cost.) For SBC dial customers, Prodigy receives $17 a month for each customer. Non-SBC customers pay Prodigy $49.99 a month for Prodigy's DSL service. Non-SBC customers pay Prodigy from $19.95 to $21.95 a month (depending upon current promotions) for Prodigy's dial service. Prodigy receives monthly management fees from Telmex, which owns 37 percent of Prodigy, for its services.